DCC #71 (Goodman Games) contains two adventures for Dungeon Crawl Classics, both written by Joseph Goodman. The 13th Skull is a level 4 adventure, and The Balance Blade is designed for level 2 characters. This adventure centers around the consequences of a deal made with a patron centuries ago. The wizard Edward Magnussen made a deal with a devil (name and powers left obscure), granting him Ducal powers and immortal life. Thirteen generation later, the evil Duke is rising from the dead, using the remains of his own descendants as fodder to do so. This adventure has everything to recommend it – cool locations, unknown monsters, interaction with other planes of existence, a tense final showdown, and even a pterodactyl. Importantly, it is possible for the PCs to survive, defeat the immortal Magnussen, and still be forced to flee town when they lose. There is more than one win condition, allowing for a lot of tension and interesting choices in play. Likewise, there is more than one possible avenue by which the PCs can assault the adventure location. The Appendix N “pulp” feel of the adventure is very strong. Players must take serious risks with their characters to succeed, or be extremely clever. A portal to Hell is open, and this adds an extra dimension (pun intended). I have run this adventure with great effect. The encounters are flavourful and appropriate. There is enough of a mystery to allow the cleverest players to feel quite satisfied when they have resolved most of what is going on. The fights were serious; the dangers real. This short adventure requires that a PC owes a patron a favour. The patron would like the PC and his group to recover the Balance Blade, an ancient artefact that could sway the balance of power between Law and Chaos, or among the Lords of Chaos themselves! No great power for Law or Chaos can wield (or even reach) the blade, so mortal assistance is vital. The adventure itself is rather linear short series of challenges. The challenges themselves are largely interesting, and if the players involved remain in character could be enormously fun. The adventure is not “fair”. It is not intended to be. One of the themes of Dungeon Crawl Classics is that the PCs are but pawns in a cosmic game, and the adventure showcases that. Sometimes pawns are sacrificed. This adventure will require some preparation from the judge. Do not imagine that you are going to run it smoothly without reading it carefully and doing the recommended prep. Because the adventure is not “fair”, some judges may wish to run it with pregenerated characters rather than with their players’ beloved cutthroats and reavers. Although I have not had a chance to run this yet, when I eventually do, it will be with regular PCs rather than pregens. I think that the impact would be far greater that way. On the other hand, this is a really, really good adventure for convention play, if you are trying to fit a four-hour slot. One has the impression that it was written for that purpose. The difficulty that I have had in running it so far is that the wizards in my groups have been rather leery of owing favours to patrons. Remembering that spells are gained randomly, from the 26 possibilities (27 if you include “patron spell”), there are only two chances to learn invoke patron/patron bond…a 1 in 13 chance. With 4 or more rolls, there is at least a reasonable chance that a PC learns this spell. Added into that, I give many opportunities to gain a patron without patron bond. Still, I find my players rather hesitant overall. In a way, that’s okay. You should be hesitant. The opening of The Balance Blade, though, starts with the 2nd level wizard having been helped by his patron many times, and that simply hasn’t happened yet at my table. If The Balance Blade is a fable about being careful what demons or gods you strike alliances with, my players were cautious about that long before Dungeon Crawl Classics fell into my eager hands! Both of the adventures presented herein are solid. The primary adventure is worth the cost of the module by itself, and is useful for almost any DCC campaign. The second adventure is a bit harder to fit in, but when you read it, you will want to use it. I know that I do. Last November, Goodman Games revealed that a new printing of this module will include "new material on magic skulls by Daniel J. Bishop". So, there's that. 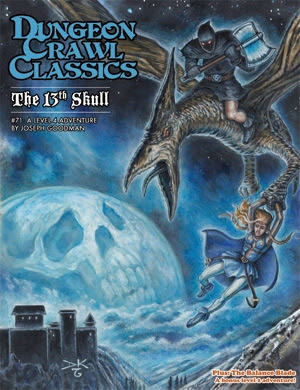 This is one of the free adventures all backers (print or pdf) of the 4th Printing kickstarter for Dungeon Crawl Classics will receive. I would have included this information earlier, but I was not aware that it had been made public yet.